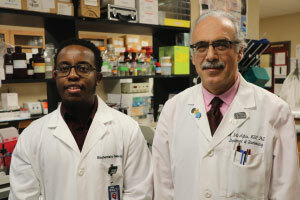 Muriu found his opportunity to research Alzheimer’s in the lab of Dr. Abdulbaki Agbas here at Kansas City University of Medicine and Biosciences (KCU). 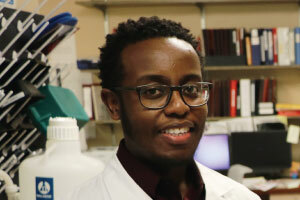 His work has been so well-received that he was chosen to present his abstract at the annual Biomedical Research Conference for Minority Students (ABRCMS) in Indianapolis, Nov. 14. “It is a big opportunity and I am so grateful,” said Muriu. Muriu will present his current research, analyzing elevated levels of the protein TDP 43 in the platelets of Alzheimer’s patients, why the mechanism (i.e, autophagosome and proteasome machineries) to suppress those levels has failed and whether high levels of TDP 43 in the blood might one day be identified as an early biomarker for the disease. The ABRCMS conference is the largest undergraduate meeting for minority students in the country, with an expected attendance of 4,000 people. Muriu says he is humbled to be invited to present. The ABRCMS conference is not only a platform to express new and exciting research but a gateway for undergraduate students to be rightfully exposed to institutions such as KCU. "I hope my attendance highlights the potential in KCU bioscience program for advancement, innovation and a premier learning environment to future graduate minority students.” Muriu said. Muriu, from Houston, is enrolled in the two-year masters in biomedical science track at KCU. His advanced research skills and presenting at conferences such as ABRCMS can be helpful in reaching his next goal; getting accepted to medical school. Students of SVN experienced life at KCU with health screenings and fun STEM activities.